Once there was a little girl who dreamed of having a Victorian Doll House to play with. The little girl grew up, married and had two sons but still wished for a Victorian Doll House. But that was not to be until the little girl, who was now a nurse, discovered a wonderful man who had one been a patient of hers, built Doll Houses in his spare time. He was a member of her church and lived only down the road from her. When she asked him if he could make her childhood dream come true, he said YES!! 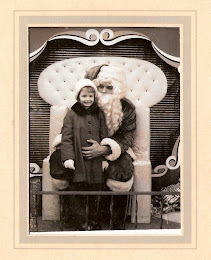 And finally , it was finished and the little girl's dream had finally come true!! She had her Victorian Doll House to play with!! She was so grateful that she contacted her local newspaper to tell the story of a man, who at 88 years old , had built over 30 doll houses! 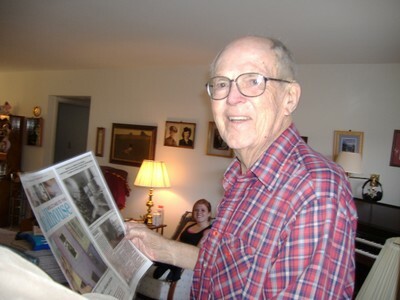 The man was so thrilled when the newspaper article featuring him came out! 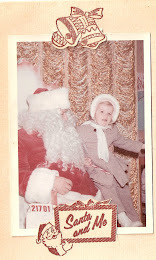 I want to thank Roy Nelson , who made my dream as a little girl, come true at the age of 50 years old. I have named my beautiful Painted Lady Doll house, Nelson Crest and the family that lives there, The Nelson's , in honor of a truly remarkable man, who NEVER charged a dime for any of the doll houses he built! The heart shaped plaque under the round window reads " Created by Roy Nelson 2008 "
Papa, reading the newspaper in the Parlor..
Notice there is no Kitchen????? I told you it was my Dream House!! Nelson Crest is one of my most treasured possessions and I will NEVER forget the wonderful man who made my dream possible!! Pink Saturday- My favorite movie is WHITE CHRISTMAS!!! This was the final Part of my Home Tour Series. If you missed any of the previous Parts, please click on the pics of each room on my side bar and the link will take you to the post that featured that room! Thanks for stopping by today and every day that you take the time to do so!! When can I move in? What a beautiful memory. Thank you for joining my party this week! Your dollhouse is gorgeous and what a beautiful story of the man who built it for you! 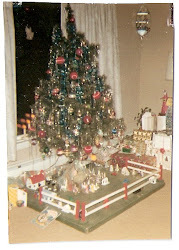 I had a dollhouse in England but when we moved to Canada I wasn't able to take it. When I was in the 6th grade my dad made one for me, it was gorgeous...3 stories and an attic, beautiful staircase. 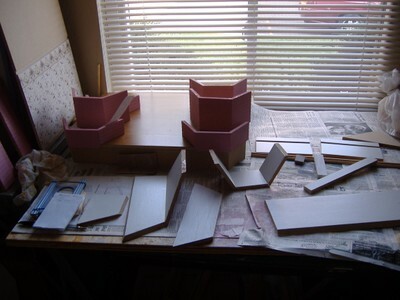 My parents split up before he was able to finish the brickwork or shingle the roof and then my mom re-married and we moved to So Cal so my dollhouse never did get finished. Several years ago my dad asked if he could have it so he could finally finish it, but sadly my mom had thrown it away:( My husband gets reminders from me all the time that he has to build me one someday! Like you, I had all boys so I never had an excuse to buy one. What a beautiful story and the dollhouse is just lovely! I can't believe all of the detail that went into the making of this dollhouse. WOW!! .....and God Bless Roy Nelson. So sad about his passing. 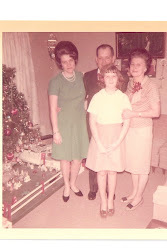 Sweet Sweet Debbie, My sister in Pink. I absolutely adore that pink house. I'm so glad you shared all these gorgeous photos with us. I'm really in the holiday spirit. Have a wonderful pink weekend. How Sweet! How touching! And precious! Great story and the house is SOOOOO charming. Awesome story! And gorgeous doll house! That made cry, laugh and stand in awe of your Mr Nelson and then all teary eyed I saw "No Kitchen" and laughed. You sure pulled all my emotional strings on this beautiful post. What a wonderful story about a precious man that made your dreams come true! I got goosebumps just reading the story. LOVE the dollhouse. Can't beat a home without a kitchen either! What a beautiful doll house, and what a treasure Mr. Nelson was. 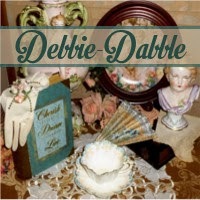 Dear Debbie..Thank you so much for visiting and commenting on my dollhouse post. 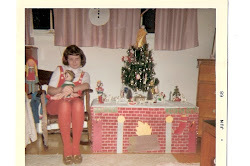 I LOVED your post on YOUR dollhouse, too. Enchanting! Love, love, love your dollhouse. Oh, isn't it wonderful to have access to our little fantasy worlds of dollhouses? Thank you so much for sharing. Susan P.S. Wish we could visit at each others houses to see the houses in person. What a sweet story, that is a gorgeous piece of decor for all time. Beautiful story, I love your doll house! What an amazing dollhouse!! I am still waiting for my hubby to finish mine!!! Maybe it will done by christmas!! I love yours, you can see it was built with so much care and detail!! 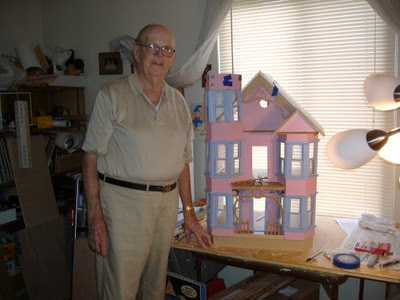 Debbie, What a beauiful story about your doll house and the man that built it. I know Roy would be so happy to know that you love and cherish his creation. Thank you so much for linking to my party and I look forward to seeing you there. This story just touched my heart. What a wonderful man to make your dream come true. It is the most beautiful doll house ever and you have it decorated perfect for Christmas. How special that you can change it around for the seasons. And the best part, no kitchen. The family in your doll house can live on love!! Your post is such a delight and thank you for sharing this beautiful story. This is one of the most moving stories I have read in a very long time! what a beautiful man to have created this house for you and for so many others!! I'm so glad you got your doll house at 50!! sometimes...those treasures we have to wait for the longest are the most dear! I bought a kit for my daughter (Humm...and me!) when she was 8 and we put up the walls and painted the outside and found furniture for it... but it still needs more work (And it still sits in my grown up girls bedroom)!! The inside needs wallpaper and oh... it has been my dream for years to decorate it for Christmas! Just last week we thought to put it under the tree this year all spruced and cleaned. I think we will - because of you and this lovely posting! What a charming story and charming house! We're becoming frequent visitors to each others blogs and I have to tell you-anyone who's favorite movie is Somewhere in Time (mine also), has many of the same village pieces (even the obscure ones I've never seen elsewhere! )and has their number 1 interest as garage saleing-must be my long lost sister.lol!!!!!!!!! Nelson Crest is the most beautiful dollhouse I have ever seen...I have tears in my eyes that you named your lovely lady after that wonderful talented special man...Thank you for sharing her with us...She looks lovely in all her christmas glory also. Beautiful story.What a blessing He was to so many people.I love the idea of the turn table.Thank you for sharing with us esp. this time of year. Oh, Debbie, I'm so glad you got your Victorian Doll house! And what a lovely man to put it together for you. I'm glad you have such fond memories attached to it. I always wanted a doll house too but never got one. I never had a daughter either. BUT now I have a little granddaughter and even though she lives very far away I'm sure someday she will get a doll house and we'll play house together when I'm with her. I love all the rooms in the house. The bathroom I noticed even has toile wallpaper on the wall! Who wouldn't love a bathroom with toile on the walls, I ask you! It's been a delightful visit, Debbie, and for a few minutes I was a little girl again. Thanks for sharing. What a special man he was to do that for people. It shows he kept Christmas in his heart all year. The dollhouse is so fun and so pretty. I loved my doll house as a child played with it till I went off to college. It's beautiful! 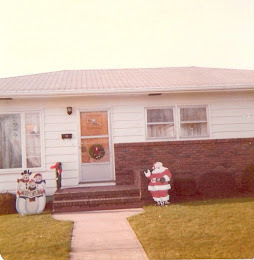 I love that you have it decorated for Christmas and I laughed when I read about the kitchen!!! What a wonderful tribute and story honoring such a gracious man as Mr. Nelson:). What a beautiful story! Thanks so much for being a part of Seasonal Sundays. Hi Debbie, what a sweet story! Made me tear up,what a wonderful man he was to do this for you. I'm sure you will treasure it all you life. I enjoyed my visit to your blog!! What a wonderful story!! What a beautiful doll house! And great writing! Mr Nelson was a wonderful man!! I have really enjoyed seeing your dolls house. I have the same San Franciscan house (different colors), but mine needs lots of work. I have looked at mine a lot lately, trying to decide whether to get busy and fix it up or get rid of it. 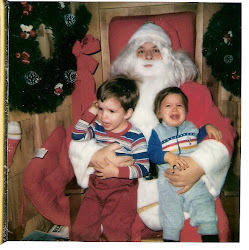 Hope you are enjoying the holidays. I am just now getting around to posting my comments on your latest posts. Goes without saying how much I love your dollhouse. I love all the attenton to the details. The story behind it is so sweet. What a kind and generous gentleman. Now off to post comments on the other posts. I'm envious of your doll house. I played with my childhood dollhouse and even still have it and most of the furniture in my attic. However, I've always wanted one of thse nice ones like yours. The man who assembled this for you must have been a saint. My aunt bought a similiar doll house but couldn't put it together. Her adult son volunteered to do it, but quit quickly after he saw how many tiny parts it had and realized how long it would take to do. She never did get it done, so I don't know if she still has it for "someday" or if she finally got rid of it. Looks like yours is very much appreciated and enjoyed! What a wonderful treasure! It is lovely. I love your dollhouse and the detail on the windows is awesome. Love how you decorated it and the story of the man you built it. It is a true treasure. Wow What a story. Very much like mine in many ways. I always wanted a doll house as a child but never had one. I aquired mine at the age of 54 when my husband bought me the same one as a kit for Christmas. We built it together over the winter. I have it painted but have never managed to get the interior decorated. I have collected a lot for it and seeing yours makes me want to really get going again on it. I recently retired and am weeding through my craft room at this time. It sits there ready to be completed. As we were building it I was working at Hobby Lobby and they had a display oned completely built and decorated min side which they no longer carried so I bought that one for very little. I do have that one totally furnished and it sets in my comouter room all decorated the year around for Chrismas. You have many special memories of a very special man. You were so blessed as were others for his generosity. And I believe he is loioking down smiling at all the joy he has given to so many. Your dollhouse is a real treasure. I am, with the help of my husband, building one. 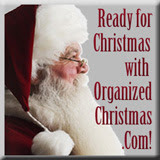 I am getting so wanting to get it together and get the rooms set up. Thankyou for sharing yours, its beautiful. How beautiful. Such a treasure. I would love a home with no kitchen...lol. The dining room is beautiful, love how beautiful it all is. cute post. Wow! Lovely dollhouse. Yours is all furnished and decorated too...I have a long way to go on slowly acquiring dollhouse furnishings. And the story of how you got it made was very sweet. I just happened across your dollhouse picture; enjoyed the lovely story. PLEASE write it down and leave a copy with the dollhouse so that its history can stay with it. As a miniatures addict, I have see so many houses and even bought a few and don't know who/why/when it was built. Ditto for sentimental furnishings. 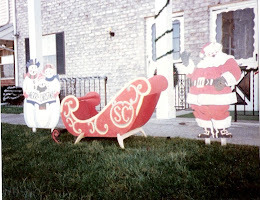 So many dollhouse stores have closed; you have to find an occasional show or buy on-line. It is a lovely hobby and miniaturists are usually such nice people! Thank you for sharing your lovely story. Debbie.. 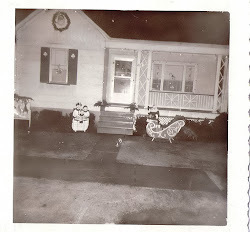 I was visiting another post of yours via the homemaking party today but saw the picture of your doll house. I love it. I have always wanted a doll house too. That was so kind of Mr. Nelson to make for you. STOP!!! Don't take that Tree Down Yet!! What are you doing today, Christmas Day? I would appreciate your vote! 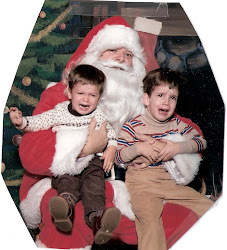 My Christmas Card to all of You! The Reason for the Season !! Tea at Sugar's Tea Room! Welcome to our Home 2010! Product Review and a few more Sneak Peaks! !